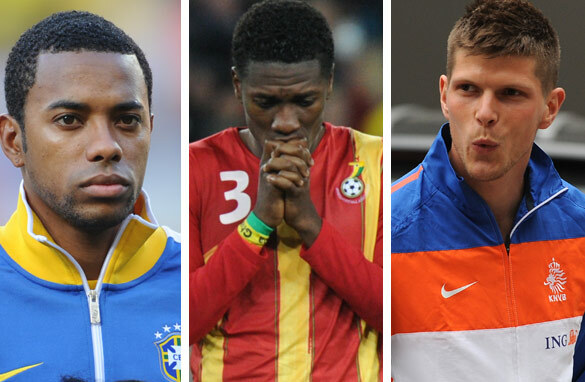 Robinho (left), Ghana's Asamoah Gyan (center) and Klaas-Jan Huntelaar (right) have all been subject to growing rumors they will be transferred before the window closes. It's that time of year again when the wheeling-and-dealing of football coaches and clubs reaches a climax, as each bid to capture their desired player before the European transfer window - gateway to the most lucrative leagues in global soccer - slams shut. As the clock ticks down to midnight of 31 August (or the slightly earlier time of 1700 GMT in Britain), contracts are feverishly written up and signed, medicals completed and agents assuaged in order for the teams' top transfer targets to be captured. Many moves have happened in the last few weeks - striker Zlatan Ibrahimovic has switched from Barcelona to AC Milan (albeit on loan), Argentine midfielder Javier Mascherano has moved from Liverpool to Barcelona while James Milner completed his transfer from Aston Villa to Manchester City - but question marks remain over the movements of some other big names. Brazil's Robinho - who famously signed with Manchester City in a last-minute deal from Real Madrid back in 2008 - is again subject to rumor. Will he join Ibrahimovic at AC Milan to complete an all-new strikeforce for the Rossonerri? Dutch goal-getter Klaas-Jan Huntelaar has been a touted target for a raft of clubs including England's Tottenham Hotspur while Ghana's goalscoring World Cup hero Asamoah Gyan could be subject of a late bid from Sunderland if journalist whispers are to be believed. The era of recession and downturn has affected the football transfer market, however, spending remains in the realms of big money. In 2009, spending in the English Premier League alone hit $711 million, compared to $618m in Spain, $540m in Italy and around $300m in France and Germany. So far in 2010, the figure stands at $464 million for England's top division, but there is still time for some cash to be splashed. So in the dying moments of 2010's second trading period, who are you hoping your club will sign? Is there a department of the team that needs strengthening or a player who has past his "used-by-date" and should be cashed in? As ever, rumor and speculation is rife in such times leading to any number of duff tips and erroneous predictions. But what is the best, or most ridiculous, rumor you have heard - and where did you get the information from? Let CNN know why the transfer deadline day is keeping you interested and we'll try to read your comments out on air on the World Sport program. Well i'm available on a free transfer from my currnet employment as a long suffering stationery rep.I'm willing to relocate immediatley(just let me hand in my notice first thing in the morning) and am not daunted by bad weather poor food or unusual cultures.I'm willing also to sit on the bench and not complain about earning a salary without having to work.I would be great value for money as i have no agent no transfer fee would ask only for my mortgage to be payed off and a small salary of £5k a week and in return would work my socks off just like in my current postion.I'm also very much a family man so no WAGS in tow or evening spent chatting to ladies in clubs and am very articulate so would be able to give a post match press conference without saying "erm,credit to..,you know,the lads,gave of two 'alves" and so forth. Please reply by way of email but don't all rush at once. huntelaar was one of the players who didn't get enough time at the world cup. he's not your go-to guy for every game, but he is a clinical finisher late in games. he's underrated and a good pickup for whoever gets him. it would be a shame to see him go to one of the english dungeon teams. i hope he stays in one of the big 3 leagues in europe. Tottenham is a very good team and will probably get either Huntelaar or Luis Fabiano both around 13 million euros if they do go that will cause all other teams needing to get players. Which will raise how much england used a lot. Ghana's Asamoah Gyan (center), he is an excellent prayer who can bring a change in Sunderland. I enjoy the Rossoneri and after the entry of Ibra, I hope that also Robinho will join the Milan club and compete with Intermilan and the best Europe clubs. Now it takes alot of money to run a football club. No wonder the bigger clubs are developing at the deteriment of the smaller clubs. I hope their performances will be worth the money spent. I heard a funny one linking the brazilian ronaldo with west ham united that is if charlton cole completes his move to liverpool, I heard it from a friend who lives close to upton park. There is nothing more exciting than sitting in front of the TV on the 31 august, anxiously waiting to hear a breaking news that the club you support have bought a player they've been heavily linked with especially if he's a world class player. It seems that AC Milan is now busy collecting strikers to alleviate its vulnerability with a team of aged players. Juventus, after the scandal several seasons ago, has been under the spotlight since the transfer window opens in June. Inter Milan, the defending champion of Europa Champions League, manages to sustain its original formation when an offer from Real Madrid for the best right back Maicon is rejected. Despite the money-rich Premier League and the star-rich Spanish League, Italian football clubs are seeking the glory in the past. man utd hav a gud team but they do need a goalscorin playmaker in the center of midfield.reds hav got gerard n torres,chelsea have got lamps and drogba,the gunners have v.persie and fabregas,name one player other than roo who scores goals like gerard n lampard n fabregas to help their strikers.ozil was a big miss. Cesc to Barcelona! He wants to be there I think that is good enough..
And Madrid well pfff I dont think they have salvation this year, CR7 started it well for them already haha and Mou should shut up a bit, so much saying that Barsa most times plays with 11 against 10, there you go, first game on your face! We know that SPURS had 4 striker bids rejected in last 48 hours but what they want is not striker but a goalkeeper and a defender! I think Stekenlburg of Ajax should move to Arsenal because he stands a better chance in the UEFA champions league than playing for Ajax. I LOVE the transfer window but the last day is terrible for my nerves. haha. There were a lot of interesting deals made this summer, that's for sure. My anger at Real Madrid def increased a bit since they signed like everyone, at least that's what it felt like. I was glad Bayern Munich didn't sign an star player. b) is an amazing player nearly everyone would love to sign.